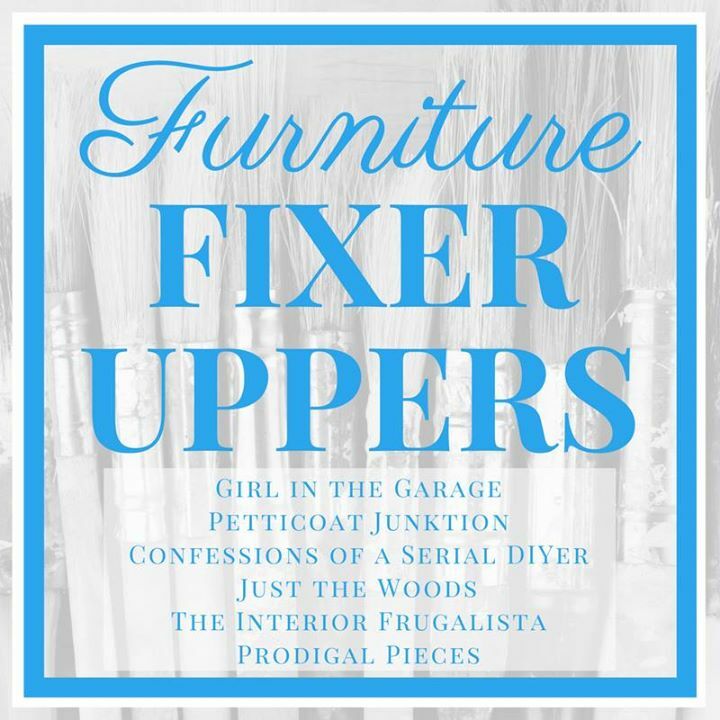 It’s been a fun run or making over the stash of furniture I purchased from a storage unit. 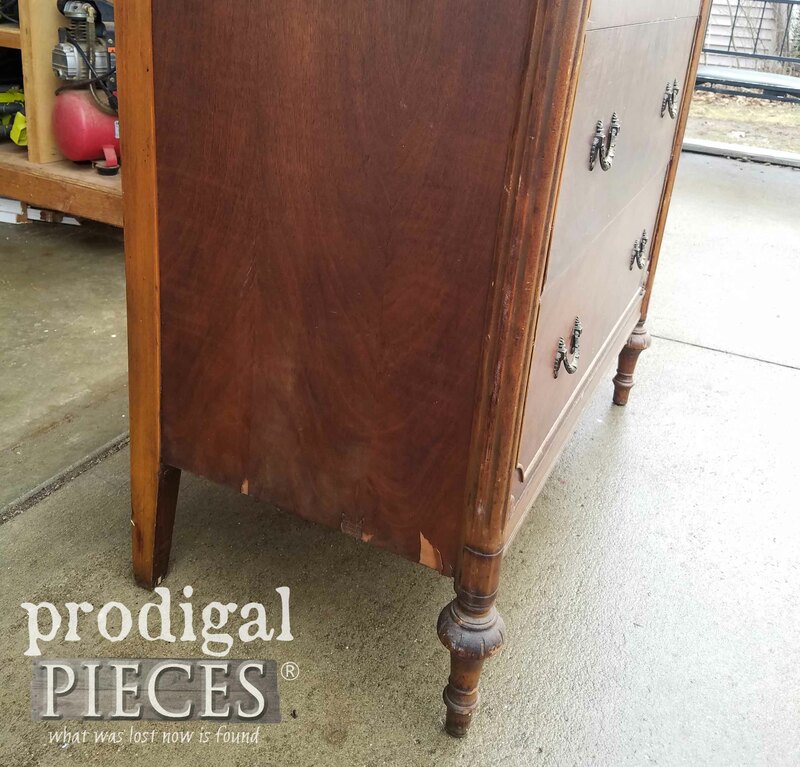 If you need to catch up, you can see the previous pieces here: (1) Mid Century Modern dresser (2) antique dresser (3) waterfall chest. Now it’s time for the last piece from that haul of goodies. 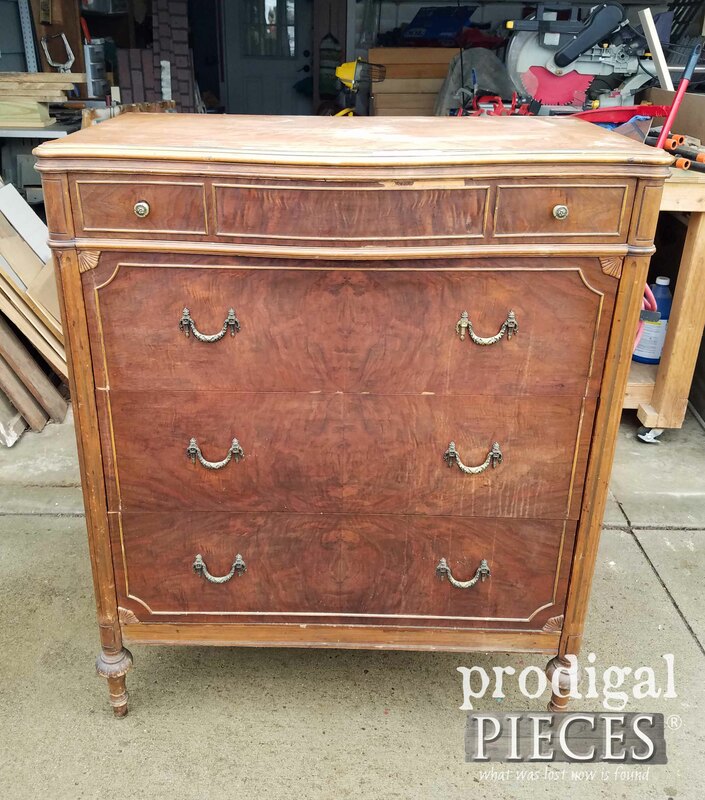 Needless to say I also have more from other places, but…here is an antique chest of drawers that looks like a match to the dresser I have in my bedroom. Isn’t it a beauty? These classic pieces were built solid and will stand the test of time. That is, except their veneer. I always get disheartened to see one flaking away, but this chest was seriously parched and so very brittle. You can see how the previous owners had tried to tape the veneer down to keep it from lifting. Each side and drawer had damage, but that’s nothing that a little wood filler and glue can’t fix. 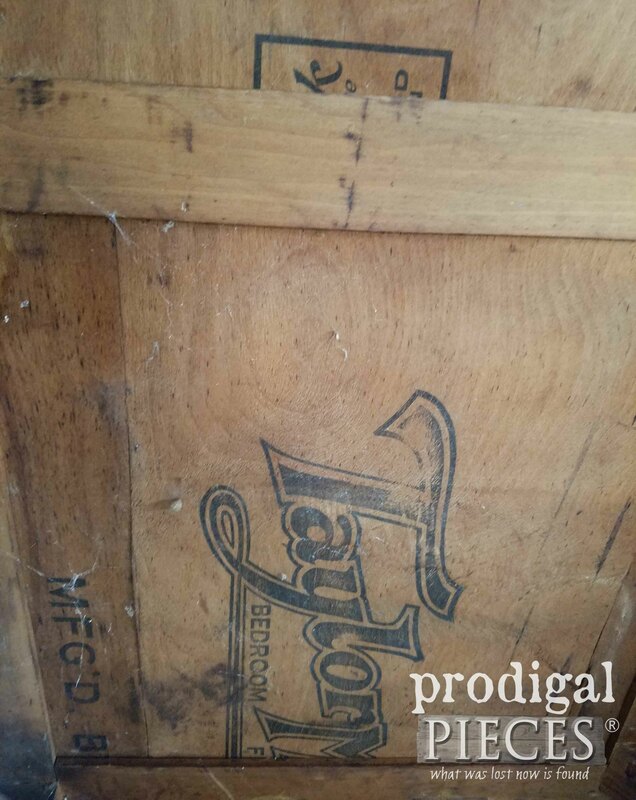 I even love finding these unique markings on pieces like this that give you the history and show their craftsmanship. To get this redo started, I begin by repairing and gluing down every loose piece of veneer I can find. There were patches everywhere and I ran out of clamps so that I had to use my locking pliers too! Hot mess happening here, let me tell ya. Oh, and notice my energetic sidekick. He’s standing guard to that the kids don’t mess with my clamps. Good dog! haha. Next, I patch every spot I can find and let the wood filler cure. Once cured, I lightly sand it all down with my orbital sander and my Corner Cat sander. A whole lotta of sanding and gluing and more sanding. The entire piece had fluffy grain from being so dried out. 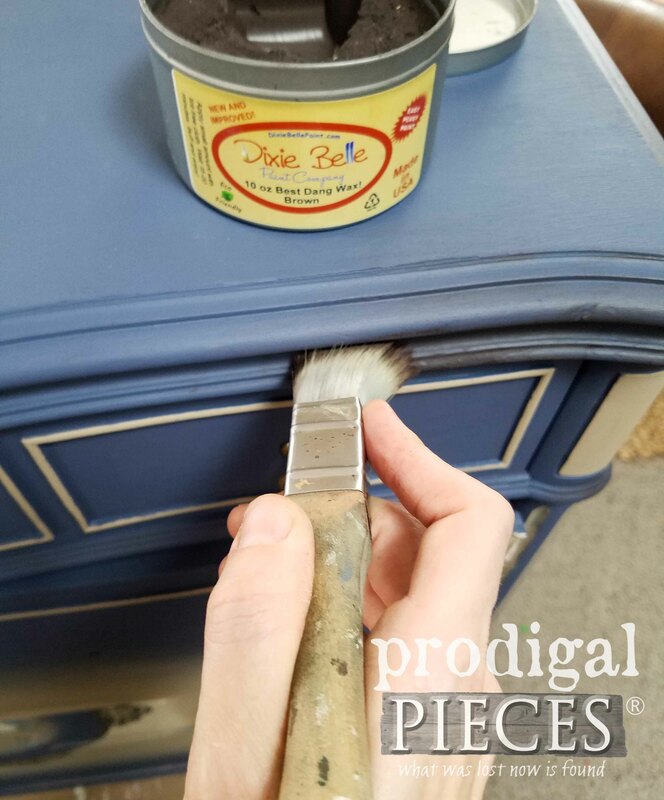 After all the prep work was done, it was time to get my paint groove on with this antique chest of drawers. I had hope to save some wood somewhere, but it all left much to be desired. So…here we go! Here’s my color scheme for this piece. I’m using Yankee Blue, Putty, and Drop Cloth along with 3 of my favorite Zibra Stubby Brushes. Yes, those brushes look like they’ve been around the block, but they last forever and keep on going. 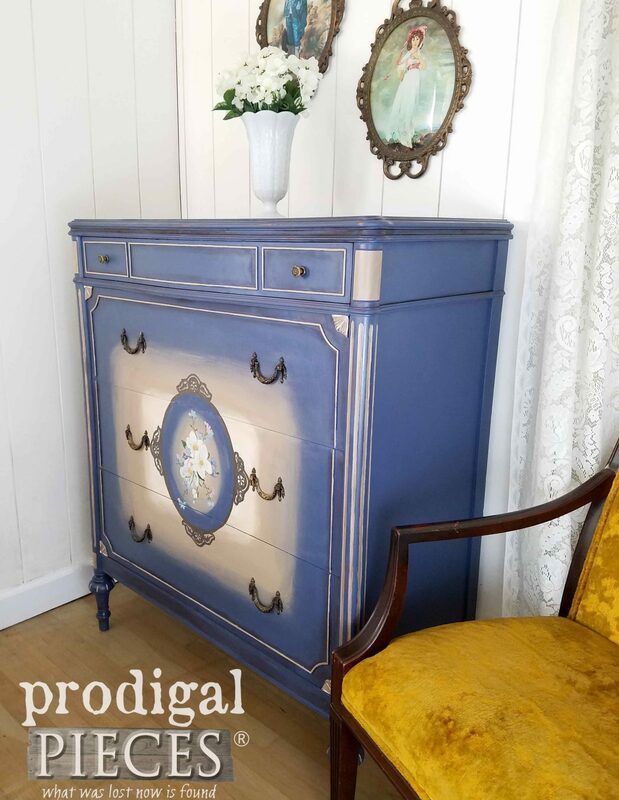 For the sides of the cabinet, I used the Yankee Blue. No primer needed, just a good cleaning with White Lightening Cleaner to get rid of dirt and grime, plus promote awesome adhesion and we’re good to go. 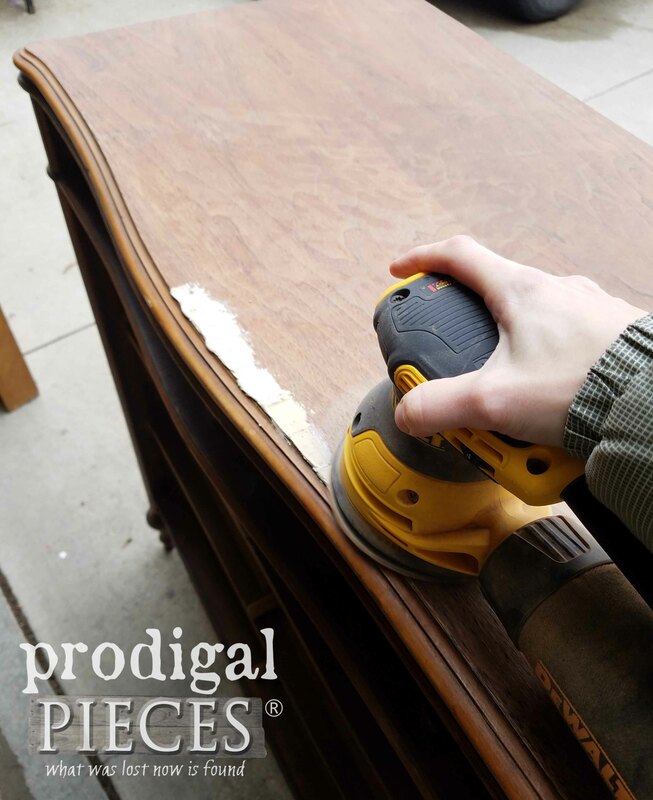 And for the drawer fronts, I decide to do the same technique as I did on my recent antique dresser and blend the 3 together. This adds dimension and drama to the piece. I love it! After doing two coats of the blending, I added some of my artwork. Because…it’s fun and I love to paint. Then once I added some detailing I used my Square Brush to accent with Brown Wax. I love the way this little brush does such amazing things. My older brushes get used for wax and handle the job beautifully. Here she is all dressed up in blue and ready to go. It’s fun to add the unique touches to a piece that is begging to shine. Many have asked why I don’t embellish like this more often and to be honest, it takes so much time and getting paid for my time is key since I have little to spare. I do these paintings for fun, mainly. I am an artist in many facets and this is just one of them that brings me much enjoyment. 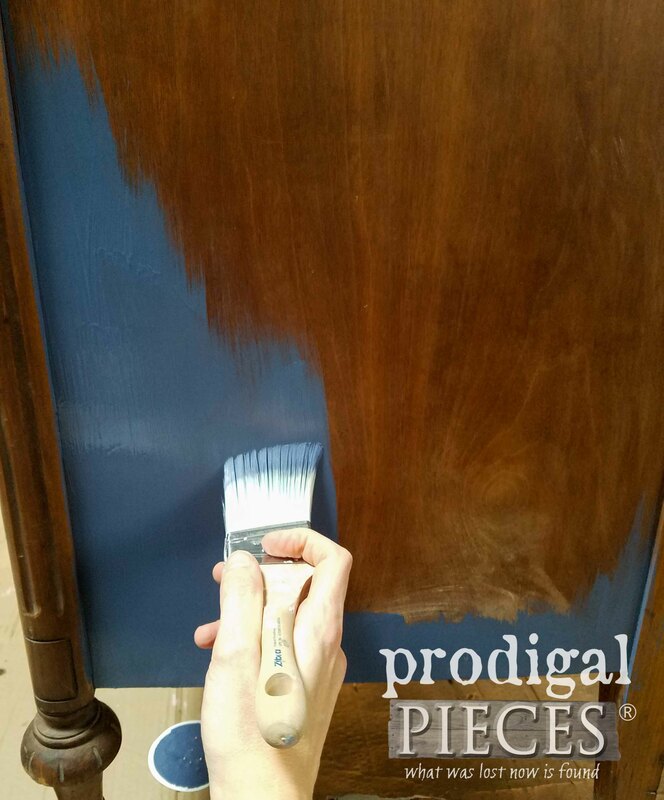 In the past people have accused me of just slapping paint on a piece, and I take offense – who wouldn’t? I am an artist, whether it’s my trashure creations, my crochet, my cooking, my woodworking, my sewing, my gardening…you get the idea. It’s no different than someone painting a blank canvas or a wall, creating with textiles, wood, etc. It’s meant to be used as we see fit. I’m here to inspire YOU. I can’t say enough that this truly was a fun project and am excited to say this was my first contribution to my Finding Home Program. So fun! 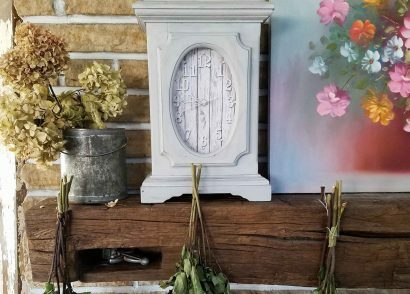 Stop by to see what’s new and sign up for my newsletter for instant discount on your first order. To get you started on your own adventure, Zibra and I are giving away this wonderful collection of my favorite brushes. Yahoo!! 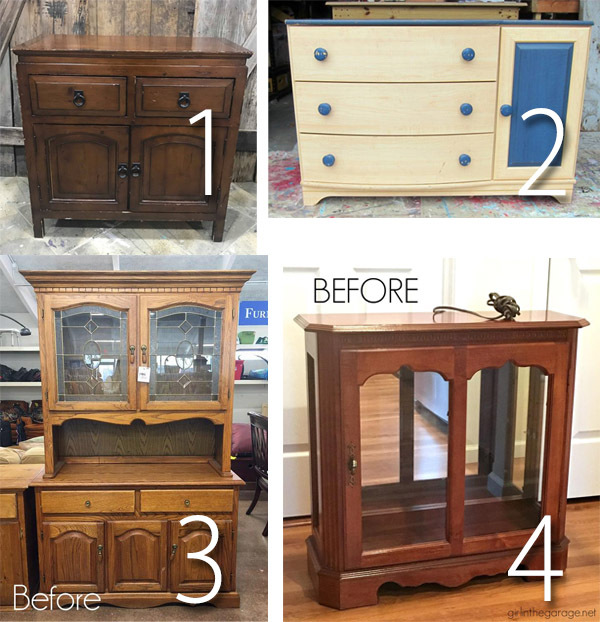 We want you to give DIY a try because…you can! Easy entry – just fill out as many of the widgets steps as you like (daily even). Open to U.S. and Canada residents 18 years of age and older. Winner will be notified via email and will have 24 hours to claim their prize. Be sure to check your spam! GIVEAWAY CLOSED. 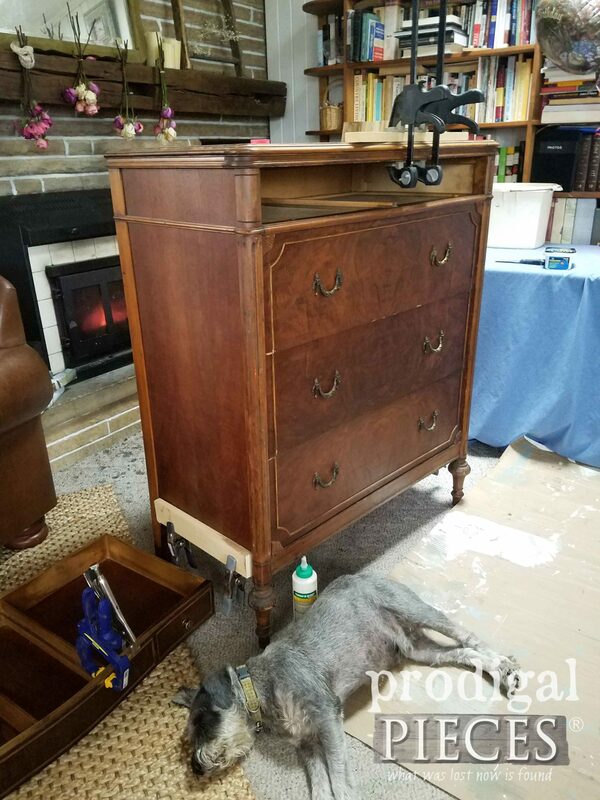 Do pin and share this antique chest of drawers makeover to inspire others to see past the worn and weary and focus on the potential that lies in each piece. I would finish off some doors to a bookshelf that need a specialty brush to finish easily. I recently began checking out your beautiful projects… you are such an amazing artist! Love your work. I have some small projects and could definitely use some nice brushes. I’ve not heard of Zibra before… hope to try them! I’m so happy to hear it, Karen. I’m glad you found me and the Zibra brushes. I love them! Wow, Larissa, this is a stunning makeover. Your artistry knows no bounds. 🙂 Seriously beautiful painting my friend. I have several folding chairs I’d like to update with paint and I’m certain the brushes would make this a whole lot faster and more professional looking. Christina, I can always depend on your for love. Thank you! 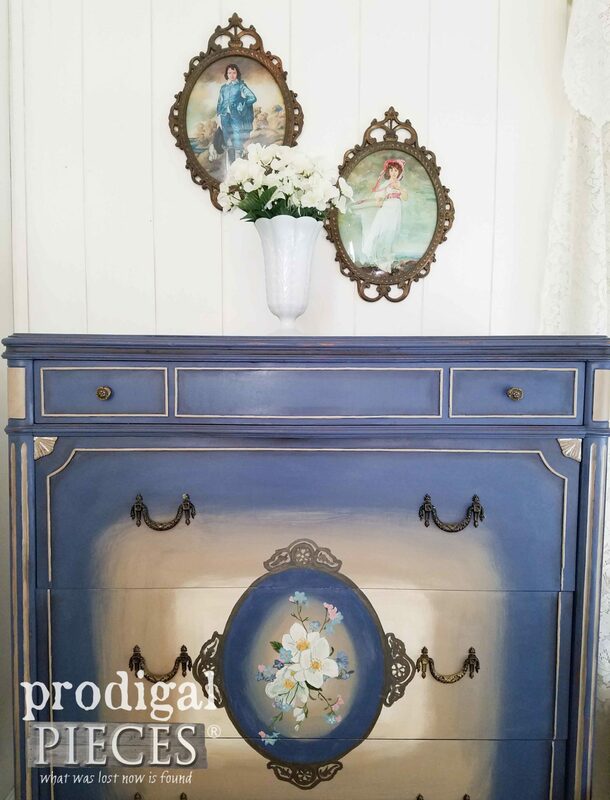 This dresser is just beautiful!! I’d like to see how you painted the narrow white line around the drawers. Do you just wing it with a steady hand? I’ve had trouble trying to glue veneer down. I would like to know how far into the loose part is far enough to glue down. You are very good and I’ve been following along for about a year but I have to ask if you’d post more pictures and include a few more steps for those of us who have absolutely NO experience yet. I’m also wondering what you do with the drawers. I’ve found that there’s always something wrong with them: either they are cattywompus, dirty, or just plain old smelling. I’d sure like to win those brushes to start on the old dresser in my basement. There was a trim that I highlighted with the brown. Otherwise you could use tape if you wanted to create that effect. Drawer are…a pain. 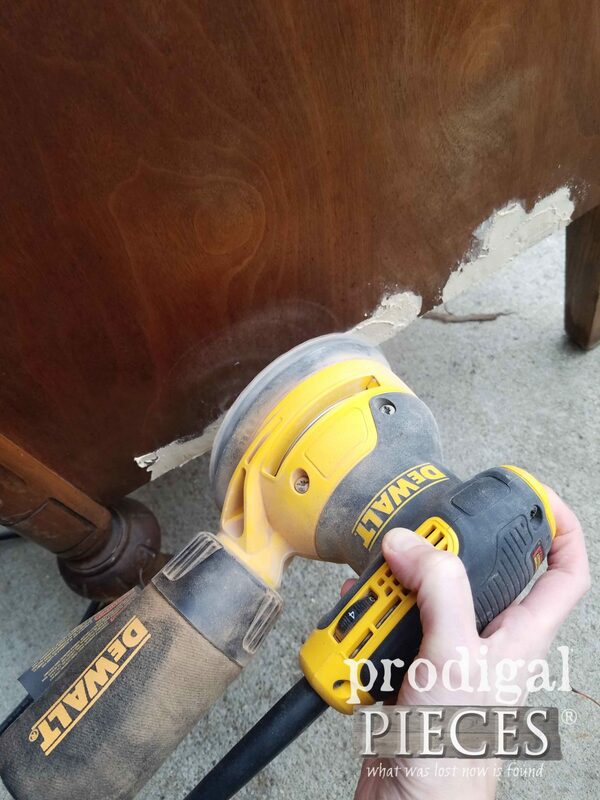 Always something to tweak with a sander, etc. Half the fun is figuring those out. Beeswax on side and bottoms, or even rubbing an old candle does wonders! Beautifully done. I like the creative approach instead of just a straight paint job. It’s not for every piece but it sure is fun to read about! Sweet update, love your color choices! I’m a fan of Zibra brushes and have a garage half full of projects waiting. Funny thing is that these hang by my desk and I kept telling my daughter I had no idea what to stage with it. As I was walking around my house looking for something, I did a head-smack. haha! I have some chairs I would like to paint. Thank you, Christy. These pieces are fun to find and dress up. Gorgeous! 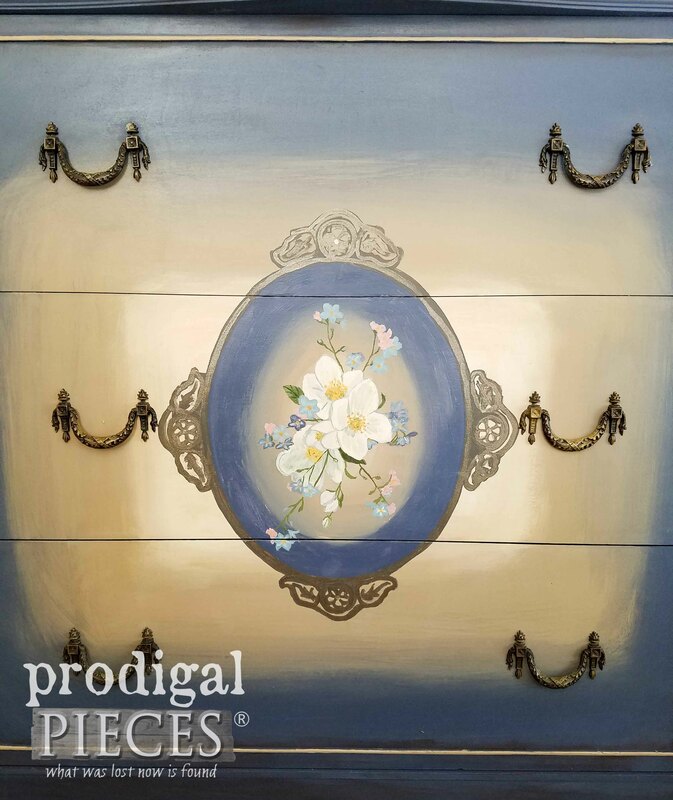 The painted detail goes so well with the framed pictures you used for staging! I was so glad to see my vintage art go with it. Fun! another great piece! You are so talented and can’t believe all that you do with your large family! Congrats on handling life so well! I feel like I’m drowning sometimes, but I am so blessed! Thank you. I love your work. 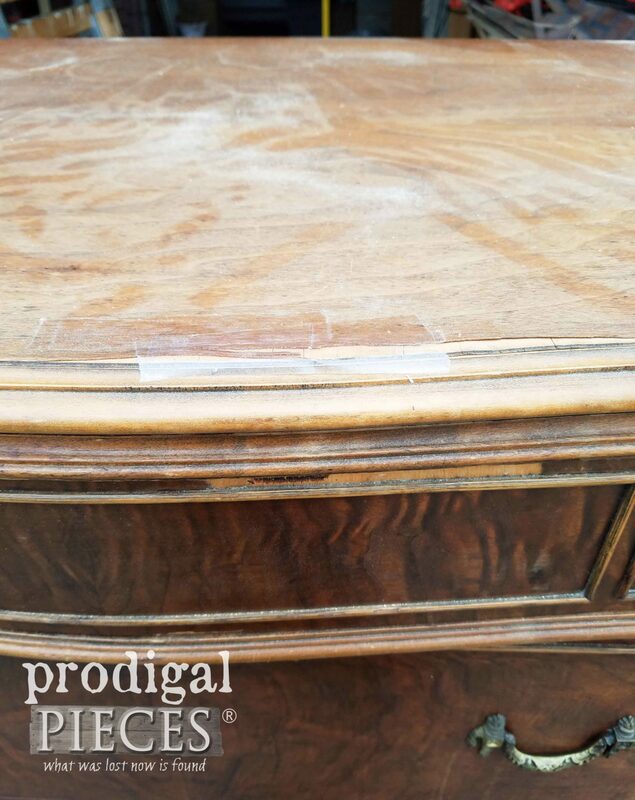 I bought an antique bow front dresser almost a year ago. Between kids, work, and working on my bachelor’s degree, I haven’t had much spare time to work with it. 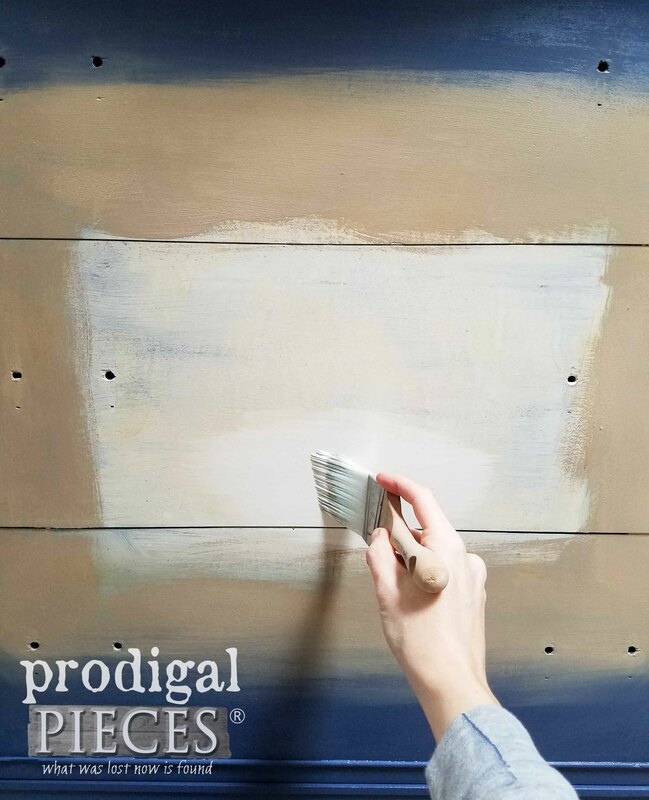 It has layers of paint and peeling veneer- so, I’m glad to see this solution for the veneer! I appreciate how you bring these pieces to life. Your personal touches make them so unique! You are a true artist because you live creatively! And you inspire others to be artists too! Thank you for the chance to win a set of Zibra brushes. 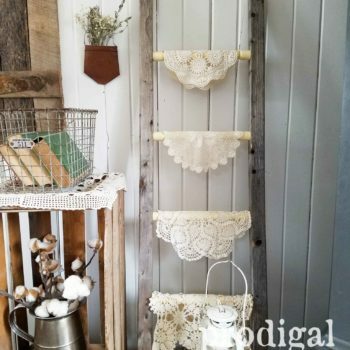 I have a couple of wall hanging shelves that I want to paint in fun colors for my boys. Your words touch my heart, Paula. I would love for you and everyone to win! My first project with the new brushes would be a jewelry box that I’d like to makeover 🙂 Thanks for this opportunity to win some quality brushes. Stunning! You are truly an artist in everything you touch. I wish I had your vision and talent. You are such an inspiration! 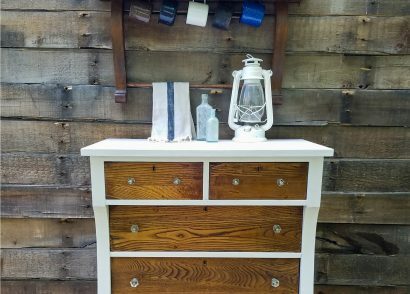 I would use the brushes to paint a dresser I have waiting to be done. I buy cheap brushes to use for painting and would love to have some good ones. Thanks for the giveaway! I love how you always think outside the box! beautiful colors blended and such wonderful artwork! I just tried my first Zibra brush yesterday and am anxious to put it back to work today..
Easy for all the armchair quarterbacks to talk about “slapping on paint” when they have probably never loved a piece back to life. Keep on keeping on! That is such a lovely dresser, Larissa. People may not understand that when you spend more time on a project, you have to charge more. Also, the more detailed pieces probably appeal to a smaller audience. Whatever you do, it must be working, so forget about the critics. You would think it’s common sense as they expect to be paid for the day’s work too, right? haha…ah well. I try! What a gorgeous renovation! I drove extra blocks through the neighborhood this morning (trashure day) in case there were “finds” left behind…not today, but your pieces are so inspiring! You sound like me! Too funny…next time! Thank you for the love. I know, right? Gotta love the make-do spirit. I’m going to be working on a small dresser and these brushes would be great! You’re so sweet! Thank you. Sounds like fun! I love the way you blend the different paint colors. Very beautiful pieces. Thanks! This one was kept on the loose side and I’m happy with it. I wanted an aged look and feel it worked out. Hugs, Janis! Love this “work of art”! You are a TRUE artist! I would use these brushes on the vintage jewelry boxes I’ve been hoarding. I wish I had the money and resources to be able to create such beautiful items as you! Recently had a double mastectomy and not able to work. 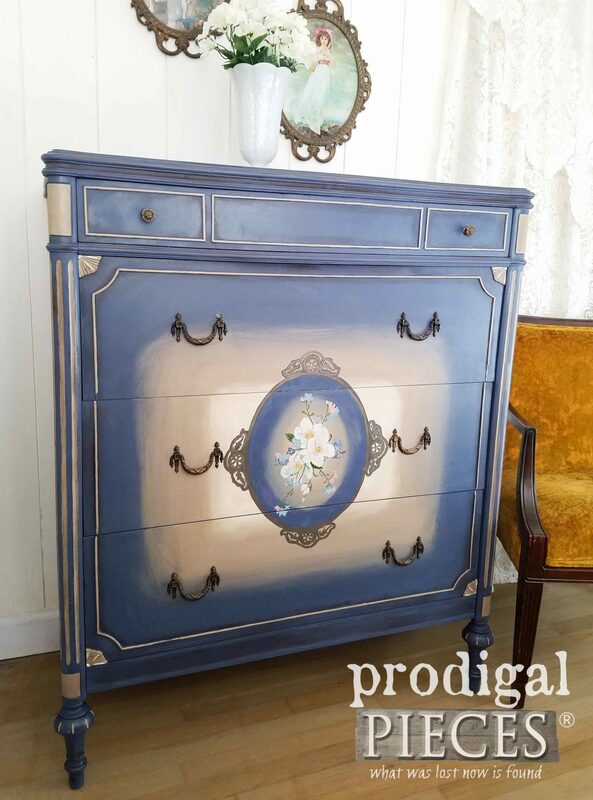 When I have the opportunity, I am going to paint a dresser like this one! I love beautiful creations, and YOURS definitely qualifies! Oh my, Laura. I’m so sorry! Glad to hear you have your eyes on the future and making goals. You go girl! You are an inspiration! Finally I am stepping out of my comfort zone and doing a project for my hair stylist. Yikes! But seeing your projects and how you do things helps me figure out what I need to do. Thanks for sharing your work! Really unique and pretty, Larissa! I would love to win those Zibra brushes, the square ones would sure come in handy. For that blending technique, speaking from an artist’s perspective, try out one of the super soft watercolor wide blending brushes (oriental style from an art supply store) – it barely moves the paint but leaves it a soft and blurred masterpiece. You can blend as much or as little as you like. They are fairly inexpensive, too. I’ve used them for years on canvas paintings, especially backgrounds. Love the makeovers, and forget the criticisms. Artists can’t escape them, and most folks don’t even realize all the work “just slapping that coat of paint on” takes !!!!!!! Bold and beautiful! Great choice of colors and techniques! Love the flower piece in the central vignette. Thank you. I hear ya on the project. I have them coming out of my ears! You’re an awesome grandma. Great color combination. You are amazingly talented! Anxious to try the Zibra brushes. Your work is exceptional. Love your simple to understand instruction s and your accompanying photos help. Thank you, I just love your blog, family,etc. Good for you! You just send me the biggest bear hug. Thank you, Liz! I have a small book shelf that needs to be painted. Another beautiful piece! I have a wardrobe style dresser to paint, still trying to decide on colors. So many to choose from, isn’t there? That means much, Jen. Thank you. I’ve been there! For me, it’s having the time. I have a list of things to do when my kids are grown and this is one of them…though I’m not wishing that time comes fast. I love them more! I really find this technique very interesting. I would love to see a video tutorial of it in action someday. Beautiful! Beautiful job on that dresser!! You truly are an artist! I know that a good brush is key to being able to achieve a really nice paint finish and would love to try out the Zibra brushes. I’m delighted to hear it, Tracy. Your work is always so energizing and inspiring! 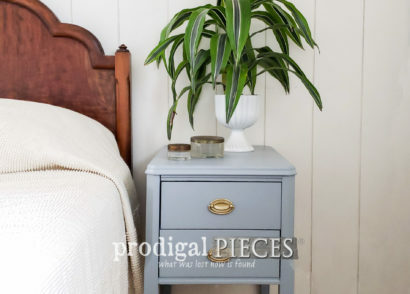 My first project would be an old side table I keep downstairs. It really needs new life! Woot! That’s what it’s all about. Thanks, Kathy! Your project sounds perfect. I know what you mean. That sounds cool! I love the Yankee blue! I have one Zibra brush I bought after reading how much you liked them. I’m a believer. They are awesome. Great job and thanks for sharing your talents with us. It’s such a rich color full of history. I’m so happy to hear it! Every time you post a new project I can’t wait to click on the link to see what your latest piece has become. Such lovely detail with the flowers… She now looks to me like a French country lady. You’ve made me giggle! I love it. Thank you for the sweet words. You made this piece so special. I love it. The colors are great. I could use the brushes. You are so talented. Hugs to you, sweet Frances. I had fun! Well, it’s pouring here, finally. But Big Dog doesn’t like the thunder so here I am at 4 a.m. waiting it out in the living room. So, what is one to do ? Well, see what Larissa is doing, of course! I love this blue piece! 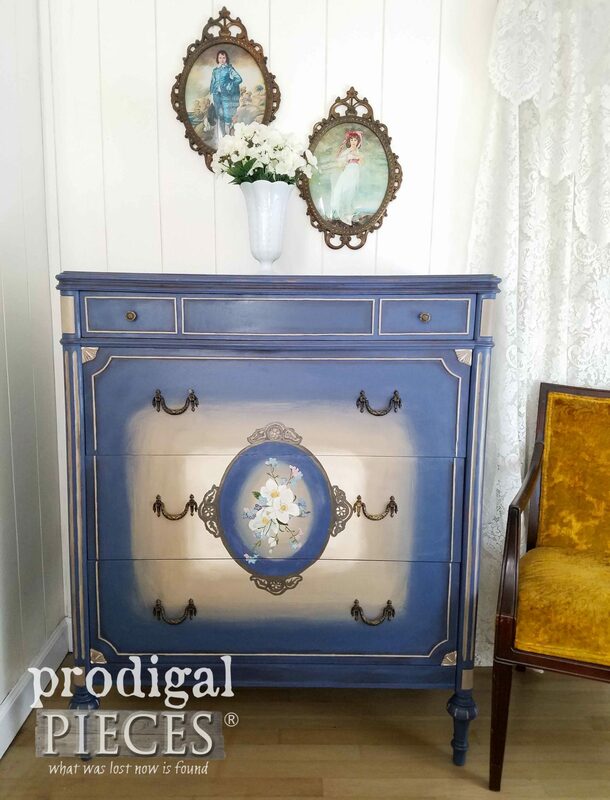 and another piece with the hand painted focal point. Where did you learn how to do that!? Just gorgeous! haha!! I’m up over here too and working, as usual. So happy you come to visit and that you like my latest piece. My mother is an artist and have just found it’s in my blood. Such fun to do! 2 birds with one stone! Learned a new technique and a giveaway for my favorite brushes, what could be better?! Thanks Larissa. I always enjoy seeing an old piece brought back to life and you did a marvelous job. TFS! My absolute pleasure! Thank you. 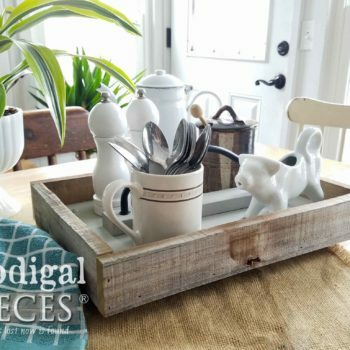 I have a hoarded collection of wood furniture and unique wood shelves that need a make-over. Just beautiful! One of these days I will have a Larissa original. You inspire me so much. I would love to have that set of brushes, I’m afraid to use my hippie family, their just to cute, lol. awww…you deserve a hug, Pamela. I was so glad you got the brushes because I couldn’t use them either. hahaha!! Very nice ! I LOVE those drawer pulls !!!!!!!! The art work looks great !!! 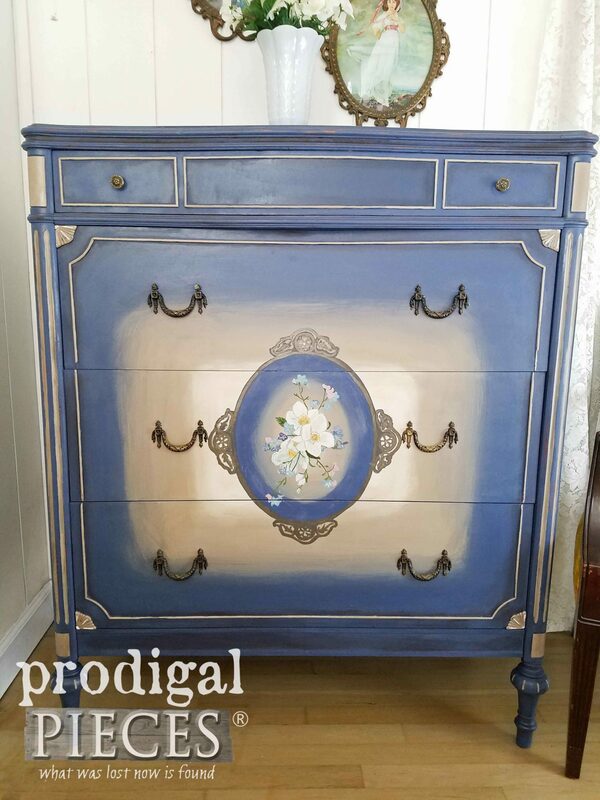 Beautiful paint job 🙂 I recently bought an armoire. It needs a lot of work before receiving a paint job but when that time comes I hope to have a few new brushes to use. Just slap paint on a piece…whaaaaaaat…you’ve got to be kidding me. Larissa, you’re definitely a talented artist and so so much more! Look at this gorgeous work of art – I challenge any of those naysayers to try this! I know…can’t believe what some people will say. ugh. So glad you like it, Marie.